Mabprachan. 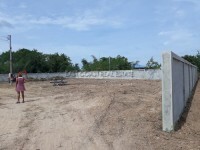 Available for sale is this plot of land near the Mabprachan Lake of regular shape measuring 2 rai and 10 square wah. There is a concrete road running past the property, which is fenced off. It is possible to sink a well for personal water supply. Owned in Thai name, with the tax & transfer being split 50/50.